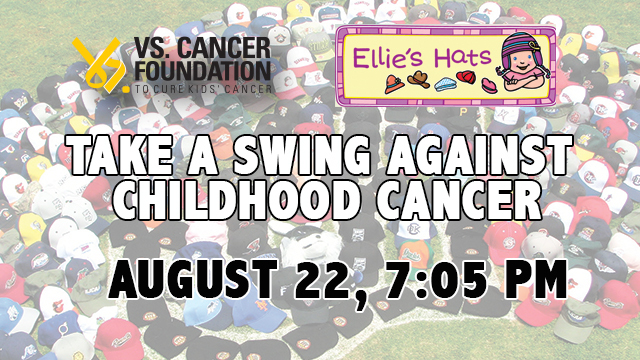 JACKSON, TENN (AUGUST 15, 2014) - The Jackson Generals have teamed up with Ellie's Hats and the Vs Cancer Foundation to take a swing against childhood cancer. On August 22nd at 7:05, the Generals will be taking on the Chattanooga Lookouts in the hunt for a playoff spot. But, the battle on the field will be in support of those children who are entrenched in a battle of their own - one against cancer. The Generals have spent months collecting hundreds hats from teams and individuals across the country. These hats will be donated on the field that night to the charity, "Ellie's Hats," who will give them to children receiving cancer treatments. These kids often lose hair from harsh treatments and the hats often become an extension of themselves, almost like a badge of courage. But, the donation isn't all that's going on. Some of the Generals players have volunteered to have their heads shaved that night to help raise money with the Vs. Cancer Foundation. Any individual attending the game will also have the opportunity to shave their heads in support. The Vs. Cancer Foundation has set up a website here to help the Generals raise even more for the cause. These donations will be split between Ellie's Hats and a local Jackson cancer treatment center, meaning every penny is used to fight childhood cancer. Fans are encouraged to bring a new hat to the game to donate to the cause, and if they do they'll receive free admission. The Generals have been recognized for their efforts by Minor League Baseball. They have been named one of five finalists for the top charity event/program in all of Minor League Baseball. MiLB gives a number of "Golden Bobblehead Awards" out every season to recognize the best of the best from around the country. This is the first time the Generals have been a finalist in any category. Jackson Generals GM, Jason Compton said the support for night has been overwhelming. "We've had teams from all over the country send in hats. We've had individuals sending along hats or making a donation to the Vs. Cancer web page," Compton said. "It just goes to show how when it comes to a cause like this, we're all on the same team. The response for this has been nothing short of inspiring. The recognition from MiLB is just icing on the cake. Any added exposure and awareness that comes from our efforts will just get everyone behind these children who are fighting for their lives." For more information, or to get your ticket to help end childhood cancer, call 988-5299 or click here. The Jackson Generals are the Double-A Affiliate of the Seattle Mariners. For more information visit jacksongeneralsbaseball.com, like the Generals on Facebook (Facebook.com/jacksongenerals) or follow us on twitter (@jacksongenerals).